How To Build A Chicken Coop ? Most homeowners like to have chickens in their places because they want to survive on the fresh eggs. Once the chicken turns into a six week, it is important to give them more than a cardboard. Here comes the need of creating a chicken coop. Of course, you can construct a chicken coop on your own, if you have some handy tools or resources. In addition, it is also good to keep a checklist on some steps that are needed for chicken coop construction. 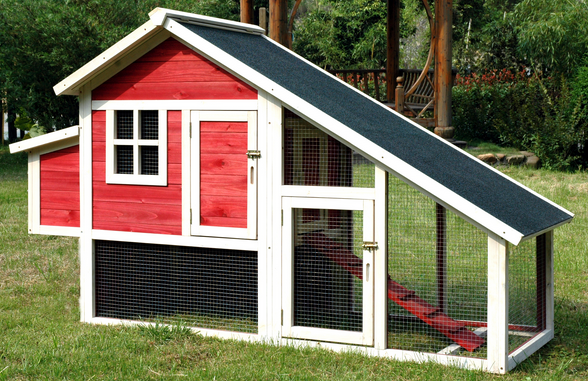 The two main components are important to consider, while building a chicken coop. First is the enclosed space to be allocated to them for laying eggs as well as sleeping. Second is the open air, in which a chicken runs to wander here and there throughout the day. 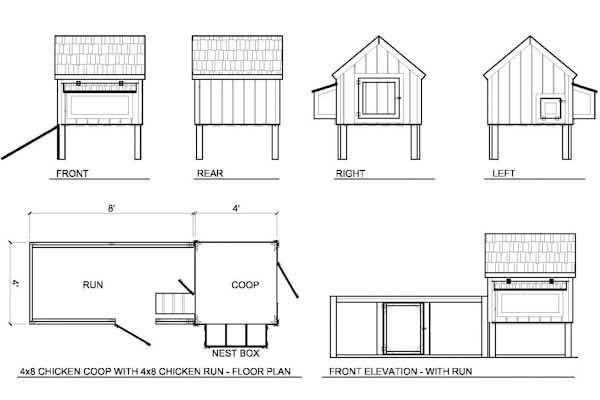 The first and foremost step to consider is the location and then, the size of a chicken coop. It depends on the number of chickens you have. The dimensions will base on the number of chickens. It is important to allocate minimum space to every chicken. The minimum space must be at least four square feet. It is best advised to leave some extra space for them. You need to choose the type of the material for a coop by keeping the protection and shelter, two things in your mind. Select predator proof hardware and the best material are the wire mesh so that the coop can be covered up from the outer portion. In order to enhance the protection levels, you can include barrel bolt latches, giving them more security from undesiredvisitors. Propping up the coop is important to consider, giving endless benefits. By elevating the coop from the ground, you can keep the feet of chickens dry, when there is a wet weather. On the elevated coop, chickens can move freely and get extra protection from hunters. 2 to 3 feet above the ground is an ideal height, you can consider. A perch area is also essential. Perches are the best way to make them sleep better. According to the number of chickens, you need to give them a proper perch space, avoiding the cramped situations. Considering the nesting boxes will give the chickens a complete and safe place to make their eggs safe. Make the boxes 4 inches deep along with alarger area to adjust as many eggs as they lay. Ventilation and insulation are other factors to take into account. Of course, every living being needs ventilation to live freely in an open air. The same is true for chickens as well. So, give them proper ventilation by installing a window or a vent into the coop to let them feel healthy and fresh. While on the other hand, insulation is equally important. Making them insulated from cold and heat is important so that they can live for a long time. It is your responsibility to check the type of environment and weather conditions to provide them with necessary insulation. Food and water are essential resources for every human being and for chickens as well. They must be placed away from the litter in order to avoid the contamination. If the litter gets mixed with these resources, the more chances, chickens might suffer from diseases. So, considering different and separate areas for litter and survival resources is a nice thing. Deciding on the accessibility is all what you need to know, at the end of a plan. Of course, you need to build a coop in such a manner that you can have an easy access to it to clean and maintain the coops. For this, installing dropping trays and access doors is a good idea to ensure your safety as well. Get to know about what type of materials and tools are needed to build up a coop, you need to collect them as soon as possible. Some materials and tools include a measuring tape, saws, hammers, masks, chicken wire, wood, gloves, nails, and much more. In order to purchase these required things, you can visit a local hardware shop. You can also talk to a shopkeeper to gather all the necessary information related to essential coop building tools and materials. In addition, you can check online, what other things are needed so that there might not be any mess during construction. When you are going to build a coop, craziness must be avoided because it might ruin your entire plan. Systematic process is needed to experience. It states that you need to take every step with great precautions and instructions from the best coop plan. You can gather information related to coop plans by having an access to the internet source. You must start from the bottom foundation to build and then move towards upwards from the ground up. When it comes to doors, roofing, and windows, they must be at the last step. When you have created a coop, painting is important to give it a finishing touch so that the coop can get protection from weather conditions and other harmful stuff. There are different painting materials out in the market. All you need to do is to keep a check on the quality and durability of the painting material. It is all about building a coop with do-it-yourself efforts. By devoting proper dedication and efforts, you can achieve success in this project. Even, you can take the support of professionals, if at any time, you feel that you are not capable of taking to its success in an easy and effective manner. Building a coop not only ends up with this, it is also important to keep in mind that the maintenance and cleaning is important for enhanced comfortability and security. So, to get the most out from your investment, carefulness must always be there! Can you suggest... Me.. I want build two coop for500chick... How much area should I take for providing.... I like ur blueprint..